Hey everyone! I hope this is going to be the start of a wonderful week for y'all! Here in the AZ desert, we may have finally crossed back under the triple digit mark, and anything in the 80s and 90s sounds good to me! Today I want to share our "Hearth Room," which we typically call our family room. Our son shared with us that in VA, it is referred to as the hearth room, and I just think that sounds so much better. So, from here forward, we have a "Hearth Room!" Before I get going on that little tour, I just wanted to share some scenes from the storm we had yesterday. Keep in mind, it did not start raining until mid-afternoon & only continued for a couple of hours. We do rain in a big way around here! We had lightening, thunder and 2+ inches of rain. 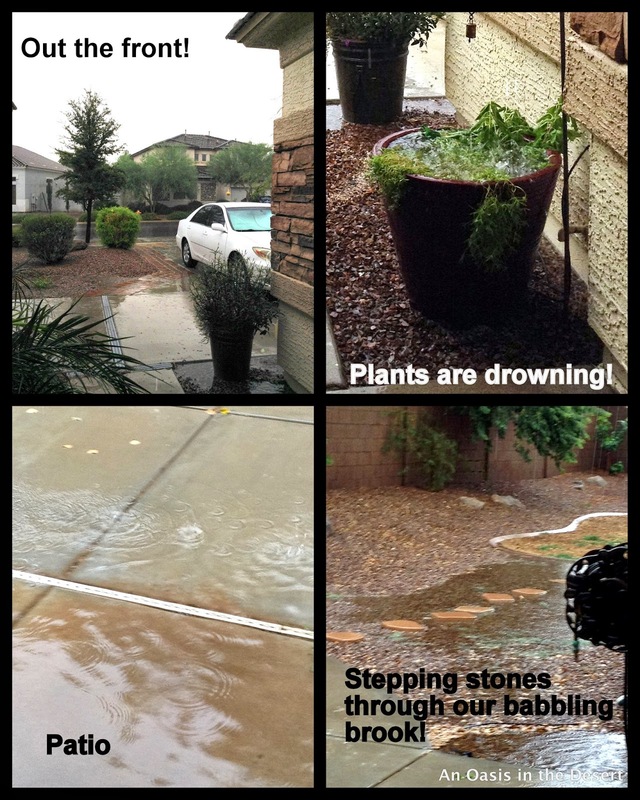 Unlike some areas of Phoenix, we did not lose power or have any uprooted trees......so thankful! Good news -- all of the rain-filled pics above are now completely dry. The desert was very thirsty! Okay, now let's move on to our hearth room, shall we? It really is a very cozy room, even without a fire blazing. Hey everyone! Is it starting to feel like Fall in your area? As I walked outside this morning to get the newspaper, it was actually cool......as in 72 degrees instead of 100 here in the Arizona desert! We will still get some low 100 degree days, but I do think we are on the downhill side of summer -- YAY! Well, if you've been following my blog for awhile, then you know I started my Fall decor several weeks ago. I've shared my foyer and sitting room HERE and my dining room HERE, but don't believe for a minute that those spaces are finished. Nope......I've already made some changes I'll share in another post, because today I want to share my favorite room (excluding my craftroom, of course), the "heart of our home," the kitchen! Do you want to see? Well come on in! In case you haven't picked up on it yet, I am still in the mode of adding turquoise, mostly in small doses, all throughout our home. lovely lady, Cindy, who blogs at Consider It All Joy, came to visit me today. We just had the best time visiting and sharing all kinds of stuff. This meet-up has been in the works for quite some time, and all kinds of "life" kept getting in the way; but we finally made it happen! I'm truly grateful for finally meeting this lovely and very sweet lady. Hey, everyone! Wow, I cannot believe we are already way into September! I got my boys (The Man & our son) off on their adventure to Peru today. I'm so excited for them and know they are going to have such a great time. I sent along my Point & Shoot Nikon and hope they bring back some wonderful pictures -- I'll certainly share some of those in the future. Anyway, while the cats away, the mouse will play in her house! Today I want to share my dining room all decked out in all her Faux Fallishness! Those are drop cloth pumpkins that you see up there. I made those last year. Just some book pages in hurricanes add a bit more interest. given to me on our summer trip. Presto-chango.......Kirklands had a super-good sale on these buffet lamps! So what do you think? I don't know what it is about this little vignette, but I'm just loving it! Maybe it's this "oh so proud" Mr. Roo! I may change out the burlap runner for something else.....hmmmm? Okay, I'm not one to wait, so here is my newly tweaked tablescape. I used a burlap runner that I added a pleated ruffle to, plus my pashmina with lovely Fall colors. Ahhh......she knows those aren't real! Hey everyone! I have been loving all of the Fall posts that are happening already. For those of us who live in the Arizona desert, you have to create your own Fall or "Faux Fall," as I've been calling it. It has been really hot here, so nothing has gone outside on my front porch yet, but there is plenty of Fall color happening inside our home. I've decided that this time around, I will be doing shorter posts and sharing just one or two rooms at a time -- I tend to get a bit "photo-heavy," so I'm just looking out for y'all.....heehee. This year I've TRIED to take a "less is more" style of decorating for this beautiful season. Some of you will laugh & say, "Sure you are, Carol," but what you will see is me truly TRYING to be more conservative. Yes, really! Anyway, I'm TRYING to let most of the photos speak for themselves and not be so chatty. Yes, really! Anyhoo, welcome to my foyer and sitting room all dressed in their "Faux Fallness!" I love that this is what you see when you enter our home. Plus, I pass through this area like a gazillion times a day, and it always makes me smile.